Take A look At This!!! 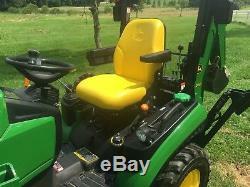 24 HP, 49 original Hours, 4x4, Dual Range Hydro Trans, Power Steering, Deluxe Seat With Arm Rests, Foldable ROPs, Mid & Rear PTO, Three Point Hitch, R4 Ind Tires Filled With Liquid Ballast For Better Loader Performance When Backhoe Is Removed, With John Deere H120 Quick Attach Loader, Single Lever Loader Control, 48" Quick Attach Material Bucket & John Deere 260 Frame Mount Backhoe, Very Very Easy To Unhook And Reattach, Two Lever Control, 12" Tooth Bucket. 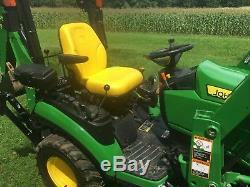 This john Deere 1025R is in excellent condition and always garage kept. Used for a few light duty landscaping chores then owner decided he wanted a new truck. 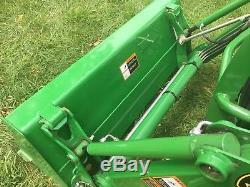 I have the manual and the three point hitch linkage for the JD 1025R. Very Very Nice and well taken care of. The owner touched up the backhoe bucket with a little black where he wore a little paint off from digging out a bush and also touched up the stabilizer pads where they touched the dirt when digging. 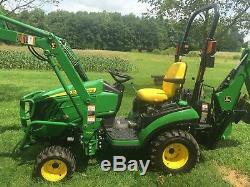 These John Deere 1025Rs are great compact tractors and will save you lots of back pain and although they will not dig like a big backhoe are much better then digging by hand. Have seen some people do amazing projects with these small units and moved lots of dirt and material. 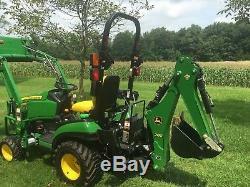 John Deere does a great job with how easy the loader and backhoe can be removed and reattached. 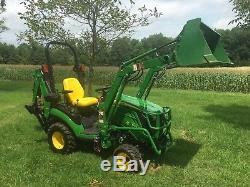 The loader does not get easier, just flip the two latches on the side frame with your foot and move the loader control lever to lift the boom up and instead the parking stand will go down and lift the loader right off the tractor, then just unhook the 4 hyd quick couplers and drive away. 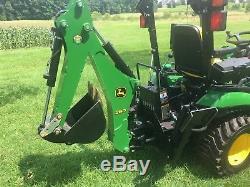 And the JD 260 backhoe is just as easy just put the bucket down and pull two pins and the use the backhoes hyds to lift the backhoe off the tractor and then unhook two hyd quick couplers and drive away. 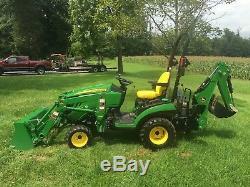 If you have a chance go to you tube and check out how easy a JD H120 loader and JD 260 backhoe are to remove and reattach. When I show people here how easy the loader comes off and the backhoe comes off there jaw drops. 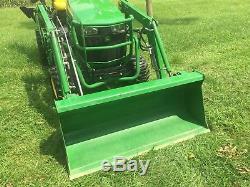 A mid mount 54" or 60" mower can be added at any time and are not to hard to find used. 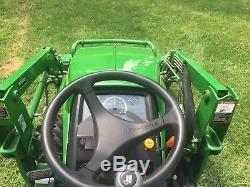 The tractor is all set up with the mid PTO. Great opportunity to save you thousands of dollars and you can tell your friends that you bought it new because it looks and runs like new. 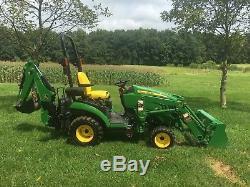 We are BWS Quality Used Equipment, located in Quakertown, PA 18951, We are in the used equipment business for about 20 years and deal in late model, low hour units. We send tractors all over the world, to people that have not seen the units and like to hear when they get there tractor that it's much nicer then they expected. 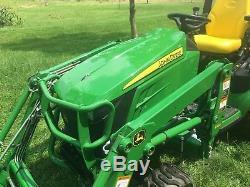 The item "John Deere 1025R Diesel Tractor, 49Hrs, 4x4, Hydro, Loader & Backhoe, Excellent" is in sale since Saturday, August 11, 2018.